Purpose: Use this document as a reference for how to enter and update personal information in ctcLink. View the following QRG(s) for additional information. Click the expand button to open the page, the click Expand. 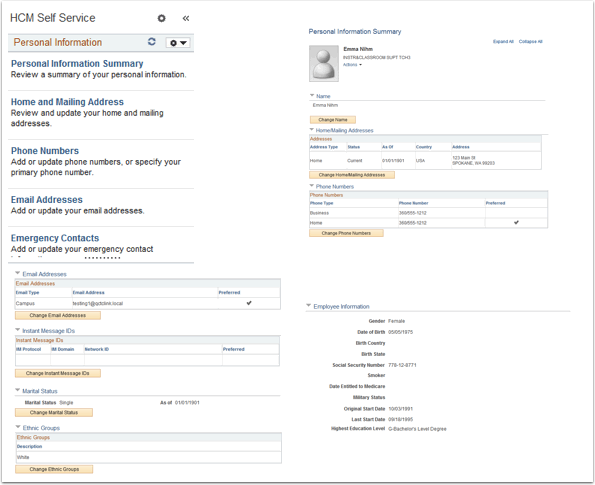 Use the Personal Information section to view and update personal information such as addresses, phone numbers, and emergency contacts. Note: Consult the local HR policy for additional information or actions required for changes. Provides an overview of all of the users personal information. Click the buttons under each section to submit changes. Instant Message ID is not used. 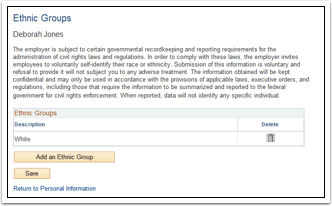 Consult the local HR department for information on submitting or modifying the I-9 form. 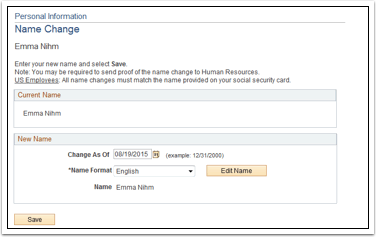 The links on the left side of the page will also allow the user to make same changes made in the Personal Information Summary section. Click the Refresh Name button. Click the OK button. The system will return to the Name Change page. Note: Consult the local HR department on additional information needed to process a name change. Click the Change Home/Mailing Address button. To change an existing address, click the Edit icon. If necessary, adjust the Change As Of date. ctcLink will automatically default to the current date. Enter the updated address information. Chose an Address Type (Home or Mail) from the drop-down menu. 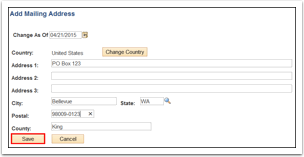 Enter the desired address information and click the Save button. Click the Change Phone Numbers button. Indicate if this is the preferred number by clicking the Preferred checkbox. To delete a number click the Delete icon (trashcan). Click the Add Phone Number button to add a new phone number. 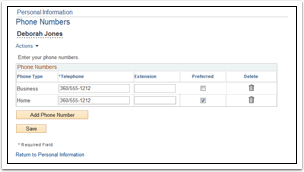 Select the type of phone number from the Phone Type drop-down menu. If this is the preferred number, click the Preferred checkbox. Click the Change Emergency Contact button. To edit the current emergency contact details, click the Edit icon. To delete the current emergency contact, click the Delete icon. To add a new contact, click the Add Emergency Contact button. Enter the new contact name in the Contact Name field. 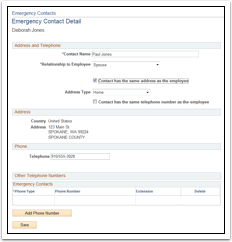 Select the appropriate checkboxes if the contact has the same address or phone number as the employee. Enter the desired phone number for the new contact. Click the Add Phone Number button if additional phone numbers are needed. Click the OK button on the Save Confirmation page. The newly added contact will display. If appropriate, check the Primary Contact checkbox for the new contact. To edit the current email address, enter the new address in the Email Address field. To delete the current email address, click the Delete icon. Click the Add Email Address button to add a new email address. 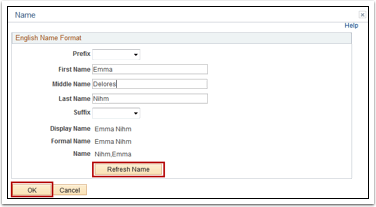 Select the type of email address from the Email Type drop-down menu. Click the Change Marital Status button. Enter the appropriate date in the Status Change Date section. 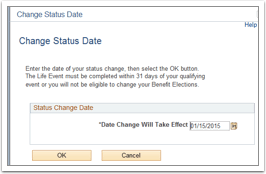 Note: The Change Status Date window will prompt for each option selected. The eBenefits page will display. 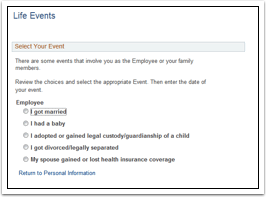 Click each link in under the Life Events section to complete the required information. Consult with the local HR department for documentation requirements. Click the Changing Ethnic Groups button. Click the Add an Ethnic Group button. Click the Description drop-down menu and select the appropriate ethnic group.